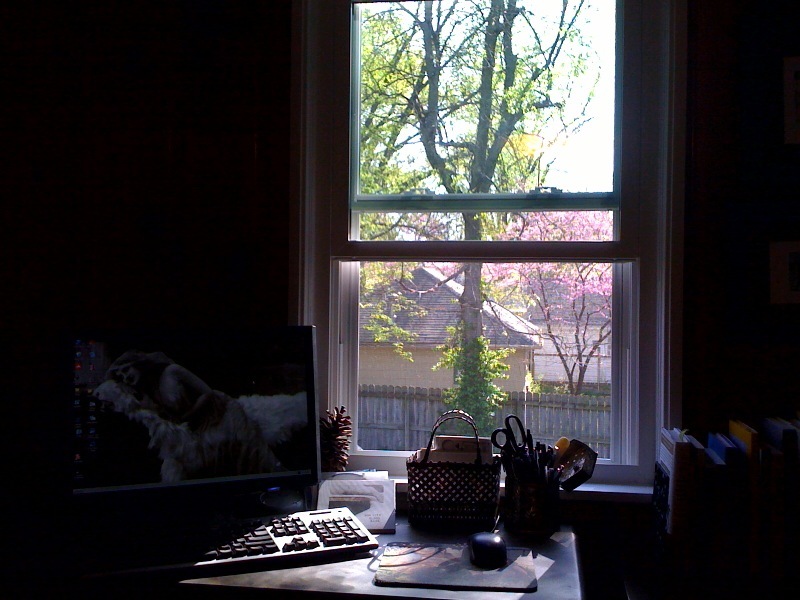 Yesterday morning, this was the scene outside my studio office window: treetops popping with electric green leafage, the weathered fence enclosing my back yard, the outbuildings beyond belonging to two different neighbors, the sun expertly illuminating the redbud tree so that it almost looks as if its brilliant magenta foliage is lit from within. Each morning when I get up, make myself a latte, and gaze out one of the windows of my house, I am flooded with a sense of peace and gratitude for the simple pleasures that grace my life. I recently read that an environmental psychologist at Cornell University looked at more than 300 children between the first and fifth grade, noting for each youngster how many plants were in their families’ homes, how much green they could see from their windows, and whether their backyards had dirt, cement or grass in them. Her findings? Those who had more exposure to green were far more capable of facing stressful situations and had longer attention spans. I think we all have an intuitive sense of that, but it’s always nice when science proves what our hearts already knew. Regardless of where you live, you can make sure to expose yourself to some soul-restoring green. I have to have my “green time” each day … at least 10 minutes of sunshine and fresh air. Restore, renew and refresh. After spending several hours in the garden today, my old body is screaming and crying but my heart is singing. Planting flowers for the summer and pulling the weeds that would eventually choke out the seedlings gives me great joy. My favorite aunt planted trees when she was almost 80, I always thought that such a selfless thing to do. Love is green. I love what you both said, Michelle and Phyllis. So true…. Am looking forward to getting out for some “dirt therapy” this weekend. Just had a load of mulch delivered…managed to replace the wheel on my wheelbarrow last night after five years of it sitting gathering dust…I am READY! And Phyllis, I plan to be one of those 80-year-olds who plants trees myself. Thanks for the reminder and inspiration.